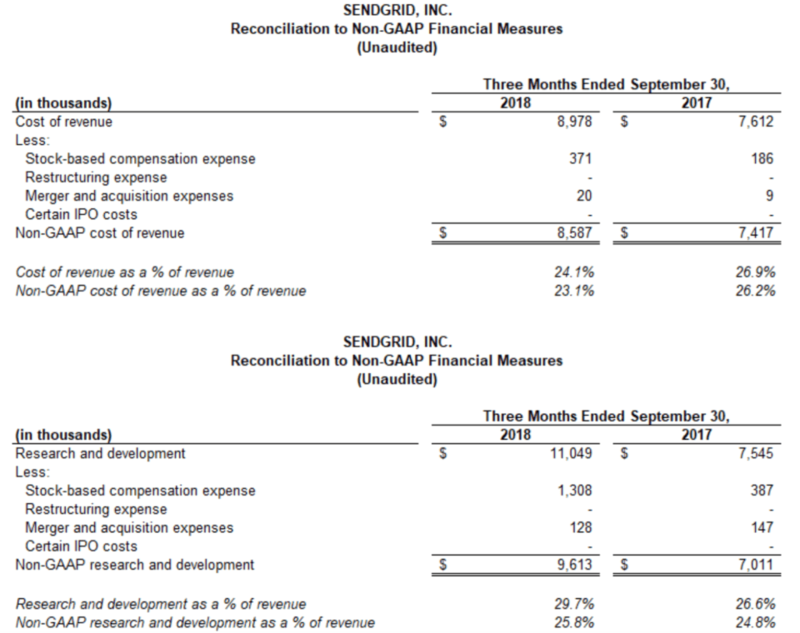 SendGrid’s Email API revenue of $29.5 million for the third quarter grew by 31% compared with the third quarter of 2017, representing 79% of total revenue, while Marketing Campaigns revenue grew by 65% to $6.4 million compared with the third quarter of 2017 and represented 17% of total revenue. 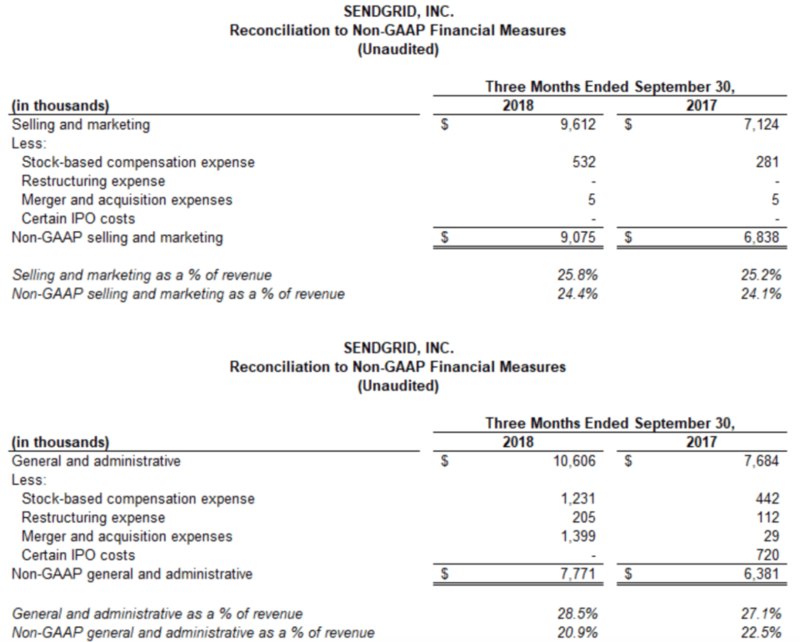 SendGrid announces material information to its investors using SEC filings, press releases, public conference calls and on its investor relations page of the company’s website at https://investors.sendgrid.com. This press release does not constitute an offer to sell or the solicitation of an offer to buy any securities or a solicitation of any vote or approval with respect to the proposed merger of SendGrid into a wholly-owned subsidiary of Twilio or otherwise. No offer of securities shall be made except by means of a prospectus meeting the requirements of Section 10 of the Securities Act of 1933, as amended. In connection with SendGrid’s pending acquisition by Twilio, Twilio will file a registration statement on Form S-4 containing a joint proxy statement/prospectus of SendGrid and Twilio and other documents concerning the proposed merger with the Securities and Exchange Commission (the “SEC”). SENDGRID URGES INVESTORS TO READ THE JOINT PROXY STATEMENT/PROSPECTUS AND THESE OTHER MATERIALS CAREFULLY WHEN THEY BECOME AVAILABLE BECAUSE THEY WILL CONTAIN IMPORTANT INFORMATION ABOUT SENDGRID, TWILIO AND THE PROPOSED MERGER. Investors may obtain free copies of the joint proxy statement/prospectus (when available) and other documents filed by SendGrid and Twilio with the SEC at the SEC’s website at www.sec.gov. Free copies of the joint proxy statement/prospectus (when available) and SendGrid’s other SEC filings are also available on SendGrid’s website at http://www.sendgrid.com/. SendGrid, Twilio and their respective directors, executive officers, certain members of management and certain employees may be deemed, under SEC rules, to be participants in the solicitation of proxies with respect to the proposed merger. 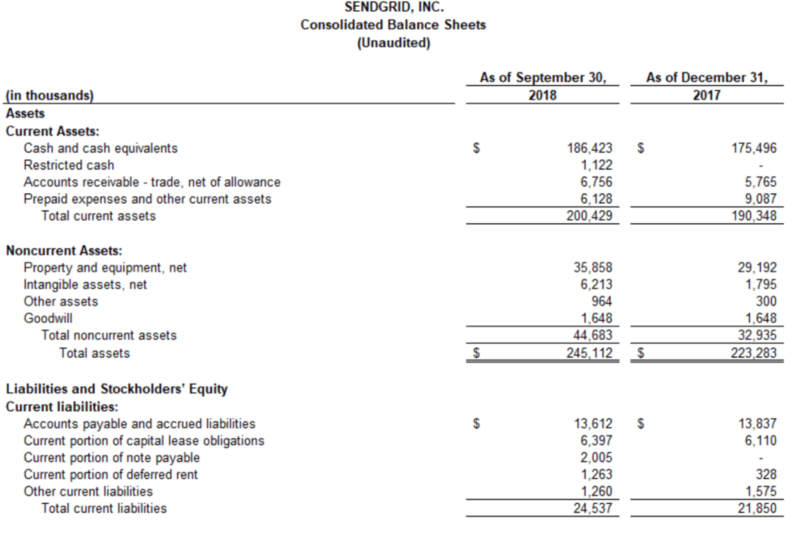 Information regarding SendGrid’s officers and directors is included in SendGrid’s Definitive Proxy Statement on Schedule 14A filed with the SEC on April 20, 2018 with respect to its 2018 Annual Meeting of Stockholders. This document is available free of charge at the SEC’s website at www.sec.gov or by going to SendGrid’s Investors page on its corporate website at http://www.sendgrid.com/. Information regarding Twilio’s officers and directors is included in Twilio’s Definitive Proxy Statement on Schedule 14A filed with the SEC on April 27, 2018 with respect to its 2018 Annual Meeting of Stockholders. This document is available free of charge at the SEC’s website at www.sec.gov or by going to Twilio’s Investors page on its corporate website at www.twilio.com. Additional information regarding the persons who may, under the rules of the SEC, be deemed participants in the solicitation of proxies in connection with the proposed merger, and a description of their direct and indirect interests in the proposed merger, which may differ from the interests of SendGrid’s stockholders or Twilio’s stockholders generally, will be set forth in the joint proxy statement/prospectus when it is filed with the SEC. Statements contained in this press release that relate to future results and events may constitute “forward-looking statements” within the meaning of Section 27A of the Securities Act of 1933, as amended, and Section 21E of the Securities Exchange Act of 1934, as amended. 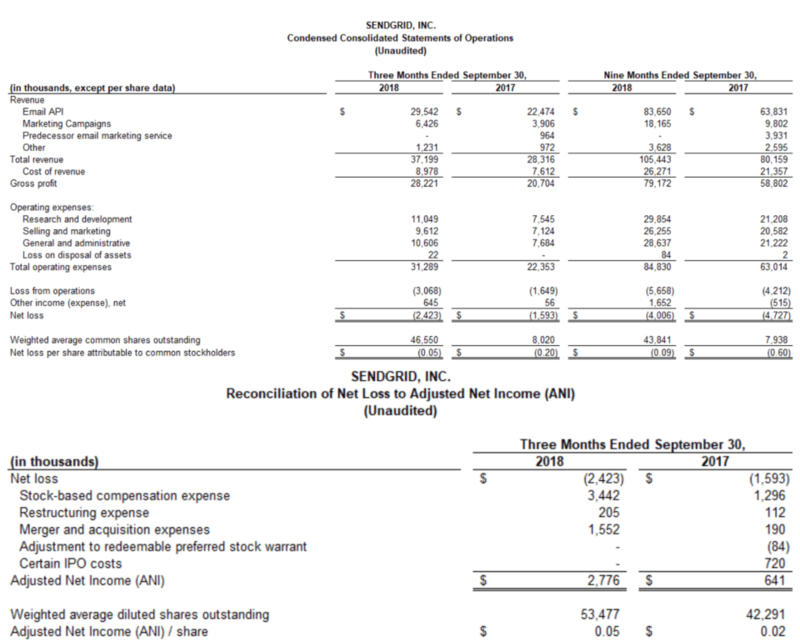 These forward-looking statements are subject to a number of risks and uncertainties that may cause actual results to differ materially from those contained in the forward-looking information, and are based on the current expectations, estimates, forecasts and projections of SendGrid and Twilio. There can be no assurances that the proposed merger will be consummated. The following factors, among others, could cause actual results to differ materially from those described in the forward-looking statements: economic, business, competitive, and/or regulatory factors affecting the businesses of SendGrid and Twilio generally, including those set forth in the filings of SendGrid and Twilio with the SEC, especially in the “Risk Factors” and “Management’s Discussion and Analysis of Financial Condition and Results of Operations” sections of their respective Annual Reports on Form 10-K and Quarterly Reports on Form 10-Q, their Current Reports on Form 8-K and other SEC filings. These forward-looking statements speak only as of the date hereof. SendGrid and Twilio undertake no obligation to publicly release the results of any revisions or updates to these forward-looking statements that may be made to reflect events or circumstances after the date hereof, or to reflect the occurrence of unanticipated events.